Belize is a country where you can never get bored. You can zip line through the jungle, go bird watching and enjoy more than 500 species of birds, but the crown jewel of Belize is that it has the second largest coral reef. Snorkeling is something that you must try while there. Not to mention the gorgeous beaches and tasty food. However, before thinking of planning a vacation to Belize, there are a few things regarding the visa that you should know. Like almost all countries in the world, the visa policy of Belize has a list of visa-exempt countries. In fact, the citizens of 101 states and jurisdictions can enter Belize without a visa and remain there for a period that cannot exceed 90 days. The rest of the nationalities, however, are required to go to the nearest diplomatic mission of Belize and apply for a visa. 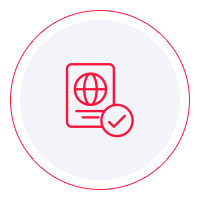 In order to find out on which list your country is, visa-exempt or no visa exempt, you can use the tool we created for you. It is called the Visa Checker, and it is located in the top right corner of this page. All you need to do is choose your country of origin from the drag-down menu and select Belize as your destination. You will know in just a second whether you require a visa or not. In the event of you needing a visa, you will be given information on the closest embassies. One thing that is worth mentioning is that some nationalities are not only required to obtain a visa for Belize, but they are also expected to get clearance. For example, the citizens of Afghanistan, Algeria, Bangladesh, and 16 other countries need to go through this procedure. iVisa does not process visa applications for Belize at the moment, but we are still eager to provide some kind of assistance, however small it may be. That is why we have a support service that we put at your disposal 24/7. The service is free of charge, and you can ask any questions you may have. As far as the requirements are concerned, it would be best if you called the embassy you are applying at. They can give you reliable information, even if you can find a bunch of it online. In the meantime, what we can tell you is that you need a valid passport. Moreover, the document has to maintain its valid status for at least another 6 months from the date of arrival in Belize. Proof of means of sustenance will also be asked of you when you arrive in Belize. You must have at least $75 per day for the entire trip. Lastly, you must have documents for your next destination. For more information, please contact the embassy. Even if we cannot take the visa application process of your back, it is our dearest hope that the information mentioned above helps you even a little bit. As soon as we can process visas for Belize, we will be more than happy to provide assistance every single step of the way.